Tigers: Quintin Berry headed for stardom or meltdown? Speedy, productive and electrifying – Quintin Berry was just what the Tigers needed. Replacing an injured Austin Jackson in late May, the rookie speedster hit over .300, swiped bases with ease and knocked in key runs over his first 35 games. When Jackson returned, Berry earned a regular spot on the regular lineup, moving to left field. But since his meteoric rise in May and June, Berry has hit a cool .250 and wasn’t in the starting lineup in three of the last four games. He’s looking more like, well, himself. At 27, Berry spent six years in the minors, bouncing from team to team, frustrating scouts with an inconsistent bat and high strikeout rate. But when he was hot, the fifth-round pick out of San Diego State in 2006 looked like a future star. In 2008, Berry was hitting a measly .235 at midseason break. Just as scouts were ready to write him off, Berry unleashed a 30-game hitting streak that raised his season-ending average to .285. His other seasons were similarly streaky. Is Berry destined for another meltdown or has he blossomed into a future star? 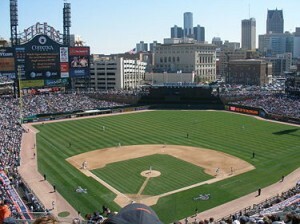 That should become clearer as the Tigers chase the Chicago White Sox for the division title and a spot in the playoffs. Berry also will have to contend for a regular spot in the lineup. Back from an injury, outfielder Andy Dirks has been sensational behind the plate. No matter what happens, Berry, who considered ending his baseball career last year, made the Tigers a more exciting team. He emerged from obscurity and became a fan favorite. Maybe we like Berry so much because he shows that drive and heart can overpower pure talent. Maybe we see Berry in ourselves.